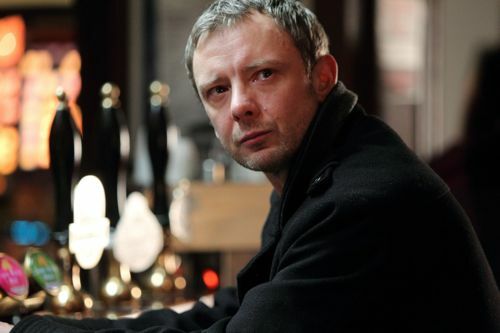 Tom Ronstadt, played by John Simm, is in a pub, unimpressed with the world of karaoke. “Have you any Smiths, Leonard Cohen?” he asks his screen sister Nancy (Olivia Colman), perusing the songbook in three-part BBC1 thriller Exile. Who then proceeds to treat the locals to her version of Britney Spears’ Toxic. There is much to love about Danny Brocklehurst’s drama, with a script as fresh as the day Morrissey first waved gladioli on Top Of The Pops while singing This Charming Man. Not forgetting John’s own track record as songwriter and guitarist with Magic Alex, which adds an extra layer to the karaoke scene for those who have followed his career. It’s a serious thriller with a shocking secret at its heart, co-starring Jim Broadbent as Tom and Nancy’s father Sam, a retired journalist now suffering from Alzheimer’s. I’ve seen all three episodes – screened over consecutive nights from this Sunday (May 1) – and they pack a powerful punch. 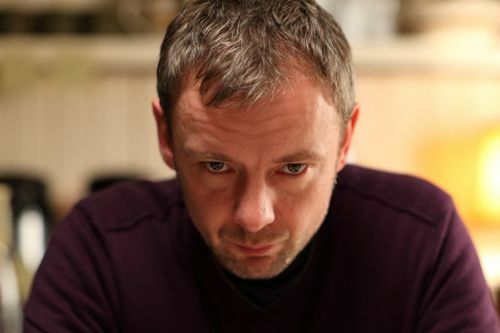 Leavened by moments of humour, including John Simm riding on the back of a pink moped – or is it a scooter? – called Valerie. 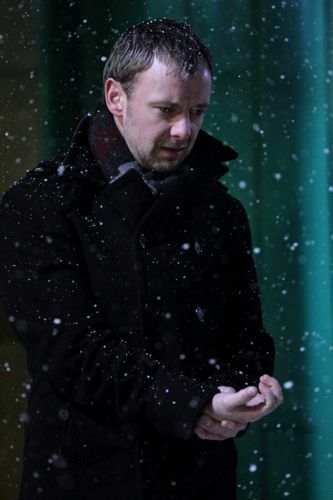 Shamefully ignored by the short-sighted panels who give out awards, John is one of Britain’s finest actors. As is Jim Broadbent. Put them together on screen and you have something very special indeed, with added fizz from the terrific Olivia. Plus strong support from Shaun Dooley and Claire Goose as Mike and Mandy. Tom strips off in the third and concluding episode to share a bath with his dad, just as they did when he was a child. Desperate to use past memories to unlock the secrets in his father’s mind. Their final scene together had me reaching for the tissues, while cheering a truly sparkling three hours of television. 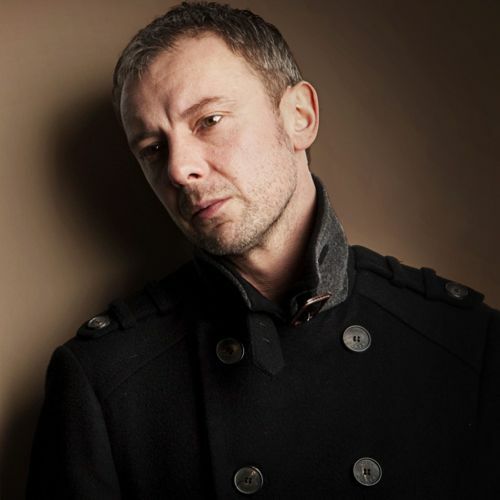 My feature interview with John Simm was published last week – you can read that here. And my interview with Jim Broadbent is due to appear later this week. For now, as promised, here are some of the edited extras from my round table chat with John that could not be squeezed into the main piece. Plus a few extracts from the subsequent BAFTA preview screening of Exile episode one and Q&A. There are some spoilers below but – I hope – nothing major. “He’s the son of a brilliant journalist, a proper journalist up north in Manchester and wanted to do that, wanted to be like him. He worshipped his father. Then something terrible happened when he was about 17 and his father beat him really badly to within an inch of his life. A terrible beating. And he has no idea why. “He found something in his father’s study because he wanted to be like his dad and he wondered why this was out of bounds. So he went snooping and he found a file with a name on it. And that’s the only thing he remembers. “So he left after that and never went back and never spoke to his father again. Never saw his father again. His sister is increasingly bitter that he’s left her to look after their father on her own. So her life has kind of disappeared doing that. She’s a lovely woman but she’s understandably quite angry with him. “He’s been down in London doing loads of cocaine and shagging loads of girls and becoming a journalist for a magazine. Did you base him on anyone you know? “I don’t know any of them. I’ve met some. But no, I didn’t base him on anyone I know at all. He became very successful but from snooping after celebs and doing that kind of thing. So he’s not very happy with himself and probably feels a bit disgusted with himself. He gets sacked from his job, hits a woman and drives back up north. And that’s where we find him. So that’s the kind of guy he is. Another actor plays the younger Tom for the beating scene? Working with Jim? One of your heroes? Did you do anything to build up the father and son rapport? So which particular Harry and Paul characters did you major on? He’s quite a fan, is he, of Harry and Paul? The appeal of this role? “I did Hamlet just before this in Sheffield and I thought, ‘There is no way I’m doing anything after this.’ I had a couple of months left until Christmas. I’d just done Mad Dogs and went straight on to Hamlet and I thought, ‘I’m not doing anything else.’ But when this arrived, it was one of those State of Play moments when you just read it and think, ‘Well, if I don’t do that then I’m an idiot. I don’t care when it is or how hard it’s going to be, I’ve got to do it. Because somebody else will do it and I’ll be watching it with my head in my hands.’ And he’s a brilliant writer, Danny. The best compliment I can pay to him, and I said this to him, was when I read it I didn’t look at the front and I thought Paul Abbott had written it. It’s that good. It’s Paul Abbott good. Obviously Paul had a lot to do with it but the writing is superb. It’s just a fantastic story. Comparisons to State Of Play because playing a journalist again? He has the journalistic skills which he’s never used properly. So he uses those to solve the mystery? 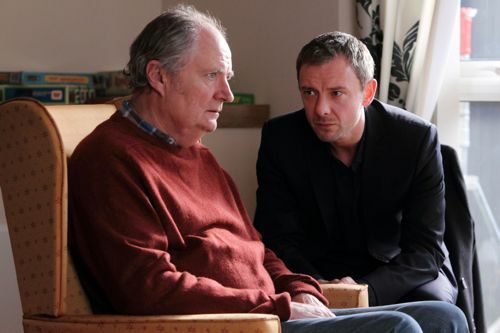 Screen father has Alzheimer’s Disease – are you familiar with that? Does Tom long to forgive his father in a way? How did he feel after Hamlet had finished? Completely exhausted? “Completely exhausted, yeah. I felt like a hollow shell. But it was incredible. It was the most incredible experience of my acting career. It was amazing. It was sold out. The reaction was stunning, every single performance. To nearly a thousand people every single time. The gasps when Gertrude drank the poison at the end, told you that most of the audience hadn’t seen it. It was just fantastic. It was wonderful. I had a great time. “And then I could start playing with it. And the best thing about the whole experience was that this part, you can change him every single night. You can play with it. Once you get that ridiculous pressure of press night out of the way, which is ridiculous…I’ve never felt nerves like it. You just literally get through it in a daze, try and get through it. Once that’s out of the way, then you can carry on where you left off in rehearsals and just play with it, this amazing character, and say these incredible lines every night. It was a joy. Having done Hamlet, is TV not as challenging for you? Mad Dogs 2 on way? Going back to Exile, was your own father in real life inspirational towards the kind of career that you’ve had? “Absolutely. He was absolutely inspirational. He’s the reason I went on stage. As everybody knows, he was a club artist. So, yeah, he inspired me to go on stage, definitely. And there were lots of parallels in it. Without me getting too personal, there are parallels that the northern boy goes down south and becomes a success and goes back up north and deals with all the people that he knew. Why tend to do no more than two series of anything? Life On Mars and The Lakes? “I think there’s many reasons. I get bored. The Lakes burnt me and Jimmy McGovern knows, because he actually apologised about the second series of The Lakes because he gave it off to loads of different writers. Loads of different producers, loads of different directors, too many cooks. And I don’t think anyone would disagree with that. It was a missed opportunity because it was so good, The Lakes, and I was desperate to do another one that good. And even though the second series was fantastic in many ways, it was nowhere near the first one, I don’t think. And Jimmy knows that. So that kind of burnt my fingers a bit and I got a bit scared about going back to do another one, of anything. So taking a break now? “Hopefully. I’m going to try to. There’s a few things knocking about but I’m going to take a little time off because I was away for most of the year. Yeah, just to re-introduce myself to the family and then off I go again. Hopefully. Father and son relationship in Exile? The scene at the start of episode one where he hits his lover, played by real life wife Kate Magowan? 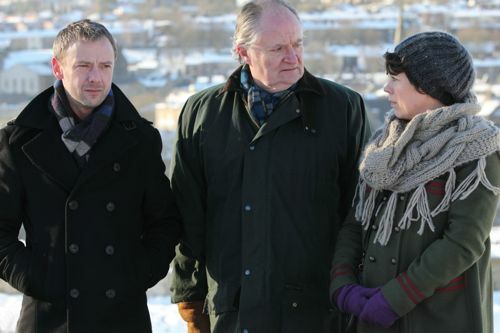 Northern drama – why is it so great? *Exile begins on BBC1 at 9pm on Sunday and continues at the same time on Monday and Tuesday. 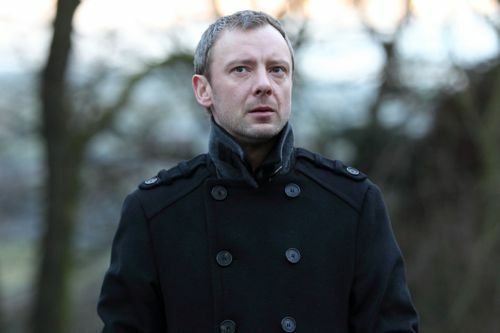 Posted in News and tagged Danny Brocklehurst, Exile, Jim Broadbent, John Simm, Olivia Colman, Paul Abbott. Bookmark the permalink.